Given the sensitivity of the proposed development and the potential for the residential garages to have impacted on site soils, a contaminated land planning condition was attached to the decision notice for the proposed development (F/04986/13). Demeter Environmental were initially commissioned to prepare the Phase I desk study report for the site to determine the potential issues relating to historical contamination of the site and to determine if any further works were required. Initially a review of the site history was undertaken using Ordnance Survey maps as well as aerial plates and street images, which revealed that whilst the area was developed in the early 1900’s the subject site was not developed until the 1960’s when a number of residential garages were erected on the site. Street images revealed the site was occupied by three residential garages up to June 2015. A number of ponds and a railway line/cutting were identified in close proximity to the site. The data provided by both the BGS and Environment Agency were used to assess the sensitivity of the groundwater and surface water receptors, which concluded that all water receptors were of low sensitivity. Data provided by the Environment Agency was used and their records showed that there were no landfills within 250m or any other potential source of contamination. On completion of the desk based exercise the site walkover survey was undertaken, which revealed that the site had been cleared ready for the construction phase, made ground was recorded to be present on the site. The qualitative risk assessment indicated that both the made ground on the site and the former residential garages had the potential to impact on site soils, hence a Phase II site investigation was proposed. 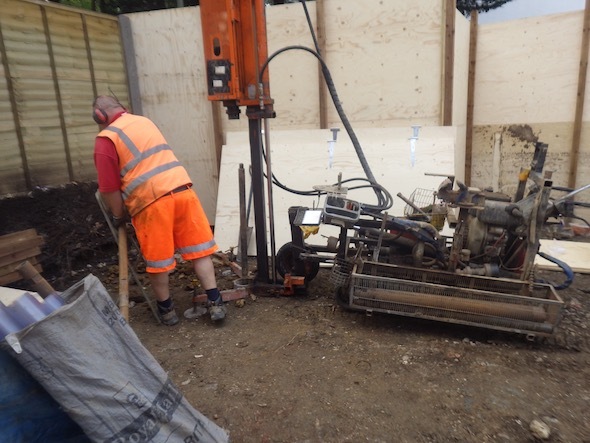 Given the small area of the site it was concluded that dynamic sampling was the more appropriate method of investigation, and to fully assess the site soils two dynamic sampling boreholes were sun on across the site. The borehole revealed a thin layer of made ground underlain by deposits of very stiff London Clay. Samples of the site soils were taken to determine if the made ground was impacted and if the residential garages had impacted site soils, the results were all below their respective assessment criteria, indicating the site did not pose a risk to the identified receptors and was suitable for the proposed use. Both the Phase I and Phase II reports weer submitted under 16/6346/CON and the contaminated land planning condition was fully discharged.